I have yet to meet anybody who doesn’t like samosas. Those delicious deep fried little triangular pouches stuffed with spicy potatoes are pretty addictive. No one can eat just one! Fortunately, with my recipe, you can eat more than one without the accompanying guilt. 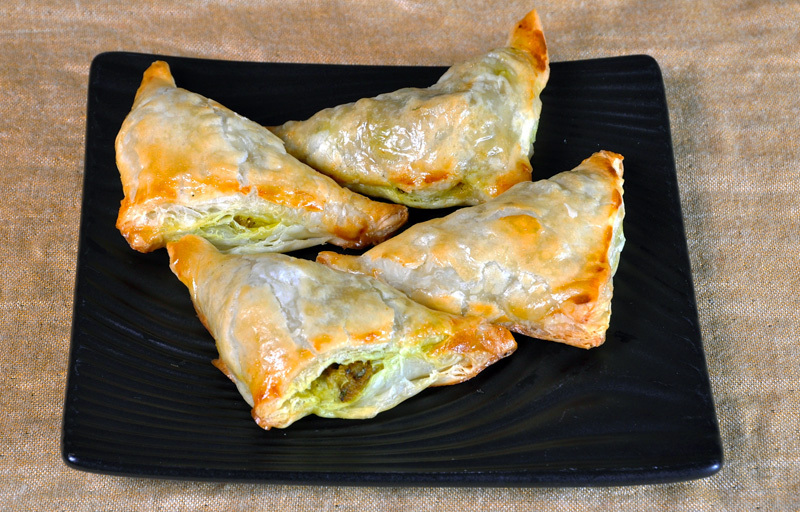 Easy to make, baked instead of deep fried, these samosas make the perfect appetizer or snack. No one can eat just one – guaranteed! Boil the potatoes until tender. Cool and peel them. Chop them into very small pieces and set aside. Warm oil in a non-stick skillet over medium high heat and add the cumin seeds. As soon as they splutter, add the ginger and garlic. Sauté for 30 seconds, then add the onions. Sauté for about 5–8 minutes, until the onions are lightly browned. Add the spices and cook for 30 seconds. Add the potatoes and peas. Stir to mix and cook uncovered for 5 minutes, stirring occasionally. Add the lemon juice and chopped fresh coriander leaves. Set this potato mixture aside to cool. You can make the potato mixture up to 3 days ahead of time and keep it refrigerated until needed. Unroll puff pastry sheets on work surface. Cut each into 3 long strips and then cut each strip into 3 squares. Dust lightly with all purpose flour. Stack in a plate. Working with one puff pastry square at a time, put a heaping tablespoon of the potato mixture in the centre. Fold the flap over the filling to form a triangular pouch and seal the edges by pressing on them with a fork or with your fingers. Proceed similarly with the remaining puff pastry and place all the samosas in a single layer on baking sheet. Brush the samosas lightly with the beaten egg. Bake for about 20 minutes, until the pastry is cooked through and the tops are golden. Serve with chutney.